Bagpipes skirl in the deep of night and a sinister presence stalks the halls of a Scottish castle. Descending to the basement where a man is stretched on a rack; hands reach out to turn the wheel, sending the man into an agony of torment. 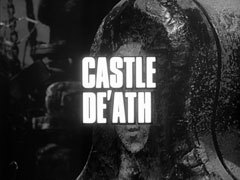 McNab (Jack Lambert) and Ian De'ath (Gordon Jackson) are arguing about having to open the castle to the public to raise revenue when Mrs Peel arrives. She smiles brightly at them and says she doesn't think they'll have any trouble attracting tourists and explains she's come in response to De'ath's letter. He has sent no letter and it transpires his cousin, Angus De'ath, has invited her. A crossbow bolt shoot across the room and lodges itself in the wall between them, Angus (Robert Urquhart) has fired it from the stairs and runs down with a smile on his face. He is devious and pretends mentioning Mrs Peel to Ian "slipped his mind". Ian grumbles about historians and tourists warns them that he is Laird and will make any decision as to the future, then stalks off. Angus takes her to meet the tame historian who turns out to be "Jock McSteed". Emma questions his lack of Scottish accent and he tells her he was "carried south by marauding Sassenachs when he was a bairn". He's writing a book on the 13th Laird, Black Jamie and Angus tells them Black Jamie's portrait hangs in the dungeon where it belongs, but Ian does not allow people down there. Steed plans to get a feel for the place by walking across the glen and asks if he needs permission to fish in the loch. Ian returns and asks what kind of fishing - an amateur diver drowned in the loch last week not three miles away and he has banned diving. Steed hands Emma a history of the clan De'ath and tells her the frogman was four inches taller when dead than he'd been alive - he'd been on the rack. Steed goes outside and McNab, on the parapets, tells Roberton (James Copeland) the 'chief' has ordered them to keep an eye on him. They're astonished when Steed sails a paper boat on the loch. Mrs Peel meanwhile descends to the dungeon where she finds the rack and an iron maiden. She knocks out a gillie who attacks her then is surprised by another. Steed returns to the castle and asks Ian how deep the loch is. He replies, "Deep enough for its purpose" then breaks off when Mrs Peel staggers out the dungeon door holding her head. Ian is concerned, saying the dungeons are dangerous and goes to get the key to lock them while Steed tends to her. She tells Steed she was jumped and asks about the diver - Steed says he was an innocent civilian but someone obviously thought otherwise and tortured him to find out. 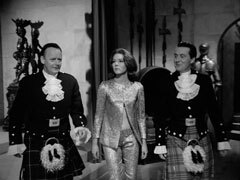 Steed tells her, after a quick highland fling with Mrs Peel playing a toy set of pipes, it's all to do with the disappearance of fishing stocks, driving the British fleet into deeper water and competition with foreign fleets - and Castle De'ath is involved. Steed notices a bowl of flowers in the hall sitting in water which is rippling. At dinner, Steed notices his brandy vibrating wildly as Ian and Angus relate a bit of family history - the De'aths have always been fighters and patriots, which Ian describes frankly as "exploitable". They tell the tale of Black Jamie's treachery, how he conspired with rival clans to betray his own. Jamie was found out and sealed inside the East tower until Doomsday; Ian will not countenance the tower being opened but Angus leads them to where the last stone was set in place and tells them Jamie's ghost can still be heard - and sometimes seen - playing the Lament of the De'aths on his bagpipes. Roberton, who is snuffing the candles in the hall, stops Steed at his bedroom door and tells him he's been moved to a different room because the East wind has made his cold. Mrs Peel wakes in the night to the sound of the pipes, which she follows to the dungeon, once again unlocked. She finds the rack has recently been greased then the lights go out and she's locked in. Meanwhile, the canopy of Steed's four-poster bed starts to grind slowly down, crushing the occupant. In the morning, Steed winces at his salty porridge; Ian notices and mistakenly agrees it hasn't enough salt. Steed watches in horror as Ian and Angus douse their porridge with a mountain of salt. Angus wonders where Mrs Peel is when Ian asks if she's insured against injury then Ian asks if Steed had any disturbance in the night. Steed tells them he didn't hear the ghost, as he's a heavy sleeper - he found the bed claustrophobic and slept in a chair. Angus mutters, "that would explain it" and Ian alarmingly says they might have better success with a different room. Steed asks if Ian was in the dungeon last night and he confirms he was, and shows him the portrait of Black Jamie he's retrieved. Ian tells Steed the ghost is heard irregularly - sometimes three times in a week then not again for a month or more. Steed enters the dungeon and finds Mrs Peel, sore and tired after a night trying to sleep on the rack. He tells her of his narrow escape. Meanwhile, Angus and Ian are arguing again - Ian is happy to have a gathering of the clans but tells him the public will not enter the castle while he is still laird. 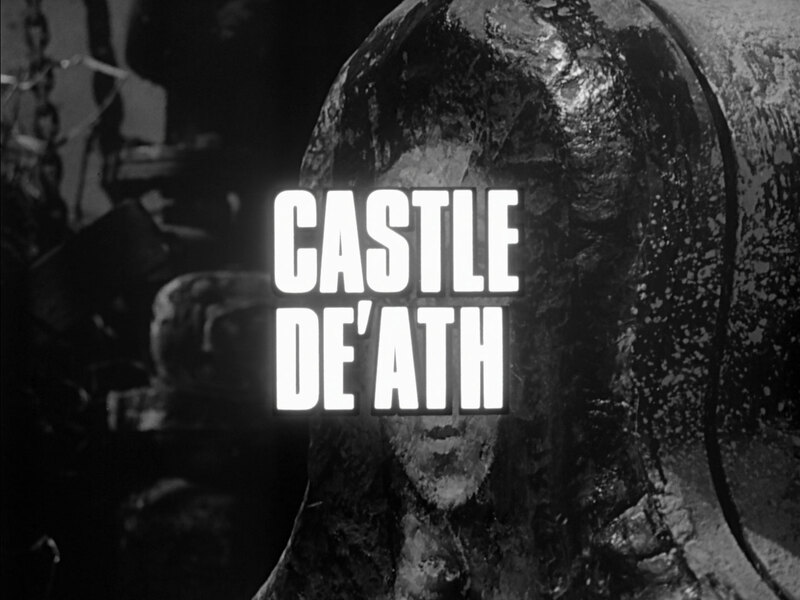 Steed tells Emma he's off fishing - in the moat this time - and leaves her a history of the castle to see if she can find more about the east tower. Ian finds Emma reading the book and tells her opening the castle would take a lot of work. He already runs a small foundry in Edinburgh which takes a lots of his time; he leaves the running of the castle to McNab - who is telling Roberton to keep an eye on Steed. Mrs Peel descends into the dungeon again and is forced to hide in the iron maiden when McNab enters. Roberton calls him and says their spotted something in the moat on the radar. McNab orders him back to control, he'll check Steed. Mrs Peel open the maiden and is startled when a concealed door in the back of it opens. 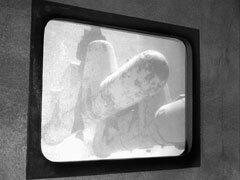 She emerges into a corridor and finds backs of machinery and turbines. Returning the way she came, she sees McNab returning angrily from discovering Steed has given them the slip and follows, but he disappears in the corridor near their bedrooms. Angus suddenly appears at her elbow and asks if she's looking for someone, then enters his room. Steed meanwhile is nabbed by the gillies when he emerges from the moat in his scuba gear. Ian tells Emma he will not open the castle and, to prevent embarrassment, suggest she leaves as soon as practical. Steed comes to in a control room, guarded by three armed gillies, and behind the Controller (Russell Waters) he sees monitors showing small two-man submarines emerging from an underwater harbour. Mrs Peel meanwhile drives off with her suitcases, provoking another argument between Angus and Ian. Roberton tells the Controller McSteed will have an 'accident' that night after the submarines go. That night, Mrs Peel sneaks back into the castle and descends to the dungeons, where Steed is being held prisoner. She knocks out Rodnuk, who's manning the power plant. Ian and Angus argue again and when Angus asks Ian what skeleton he's hiding he is order to leave the castle. 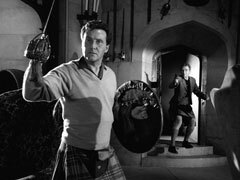 Steed meanwhile overpowers his gormless guard and surprises McNab and the Controller - he's worked out the whole setup and realised the bagpipes cover the noise of the generators. Roberton rings to tell them a woman has attacked Rodnuk and then a gillie knocks Steed's rifle away - McNab draws a Luger and he's recaptured. McNab goes to 'keep an appointment with Black Jamie' while the pens open, Ian wanders bewilderedly around the grounds, seeking the source of the pipes. The controller orders them to put Steed into the pens but he tricks the gillie and in the confusion the rifle goes off, hitting the controller and making the controls short circuit. Mrs Peel finds McNab playing the pipes on the parapet of the East tower, the stone wall pivoted round and wide open, and they fight when he returns inside. He falls to his death onto the banquet hall floor and Ian and Angus arrive. Mrs Peel seeks Angus' help and he fights past Ian then rushes her. She realises her mistake too late - he knocks her senseless and throws a dirk into Ian's chest. Rushing upstairs, he encounters Steed and they fight with swords back down the staircase. Emma recovers and kills Roberton with the crossbow when he tries to shoot Steed from behind. Angus realises the game is up and runs for the door behind the iron maiden but it jams and he is killed. 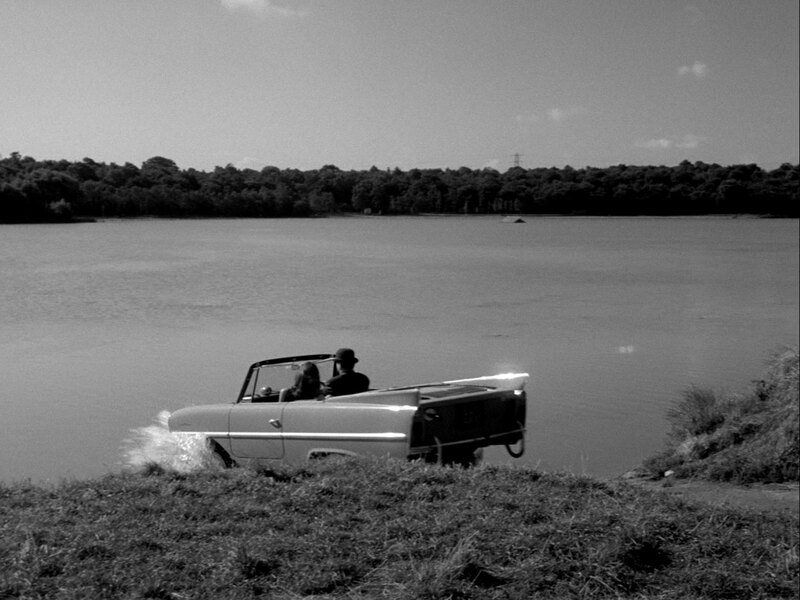 The Avengers drive off and Mrs Peel says it's a pity he didn't get any real fishing in. 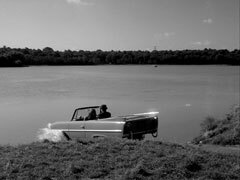 Steed says he will now and turns right, across the loch, in his amphibious car.